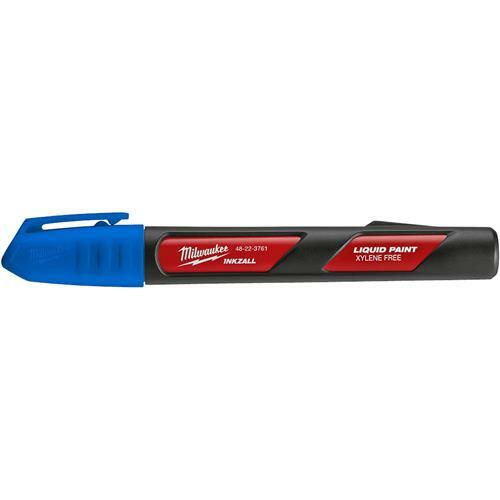 Milwaukee INKZALL Liquid Paint Markers were designed from the ground up to provide users with the best performance on tough jobsite surfaces. All Liquid Paint Markers feature a durable acrylic nib that can write on the dirtiest, hottest and roughest of surfaces. Proprietary paint developed specifically for INKZALL can mark on surfaces up to 300F and dries in 10 seconds. For the most demanding environmental conditions, these markers provide the longest lasting marks that are both water and UV resistant. Single pen, blue paint.